Camping tent styles are all designed for different outdoor activities. Tents come in many sizes, styles, and shapes, so you should know the functions of each one to help you choose the tent that is perfect for you. A pyramid, cone, or teepee tent has a very basic design. It is easy to setup as it is made with a single layer of waterproof fabric. The tent is usually held up with a single pole in the center, with the sides staked out securely. 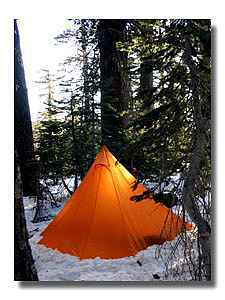 The teepee tent is liked especially by ultra-light backpackers because of its simplicity. It doesn’t have a complicated pole system and the center pole even doubles as a hiking stick in some models. The teepee tent is usually floorless. Car campers sometimes use it as a potty or shower tent. The teepee tent has a high entrance and sloping sides, which offers good head room in the center and an excellent place to store gear as the headroom disappears with the inclined sides. This type of tent isn’t very secure against mosquitoes and other insects, though. It also doesn’t stand up well in anything less than the best of weather conditions. The teepee tent can accommodate one to three people. each end forms a “A”, with a single ridgepole across the top to hold up the tent’s canopy. This style is also called a pup tent. The sloping sides do restrict the interior headroom, but A-frame tents have an efficient rectangular floor space. The angled sides sag in wet or windy weather, so other, more weather-worthy designs have mostly replaced the use of A-frame tents. Another popular camping tent style for lightweight tents is the Modified A-Frame tent. It is like the A-frame in many ways. This tent, though, has a curved center pole along the ridgeline that makes it a little like the hoop tent. The additional pole in the center and also the other curved poles provide the tent with more headroom and extra stability. Like the A-frame tent, it also offers an efficient rectangular floor space. This tent may sometimes be equipped with a vestibule and rain fly. 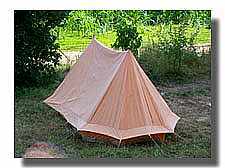 One end may be smaller on some modified A-frame tents to cut down the amount of fabric and thus decrease the tent’s weight. The modified A-Frame tent will usually accommodate one to three people. The Dome Tent is shaped like an upside down bowl. It is the most popular, all around camping tent style for all types of camping. It is a good choice for a summer or three-season tent. Most dome tents are moderately priced and well built. They can be found in a wide variety of styles, shapes, and sizes. The shape may vary greatly. Some include: hexagonal, square, rectangular, irregular quadrangle, or even hexagon. They all use a geometrical design with the poles to hold the tent up. Dome tents are easy to setup and take down. Some models actually have poles built in for extremely easy setup. They use space more efficiently as they fold up compactly for packing. They do weigh a bit more than most other tent styles They will also keep you dry during rainy weather and are good at shedding both rain and snow. One downside to the dome tent is that it’s structure leaves large areas of unsupported fabric. This means the roof support may collapse in very heavy rain or snowstorms. A Modified Dome Tent is almost like the dome tent, but has a square floor area and extra cross poles for support. 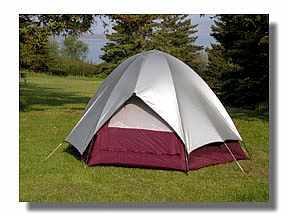 Some modified dome tents may have one end tapered lower for less wind resistance. Nearly every four-season tent is a modified-dome tent. The most wind-worthy camping tent style of all modified dome tents is the geodesic dome tent. It has multiple pole intersections that will stand up well to high winds or snow. The tunnel tent has a structure of simple side to side arched poles like a covered wagon. It forms a tunnel with a series of hoop shaped poles (usually two or three). Sometimes an extra center pole is used to keep the walls from sagging. It is one of the lightest and easiest to pitch shapes available. Because it is a light and compact tent option, this camping tent style is extremely popular for backpackers, hikers, and bike campers. It is easy to setup and is relatively lightweight with a good amount of floor space. It has good headroom and steep side walls. It has more headroom than an A-frame tent. A tunnel tent works best as a summer or three season camping tent style, and is fine as long as the wind doesn’t blow hard. It tends to rock and roll in crosswinds and won’t stand up to high winds or snow. Some hoop tents, though, may be more equipped for harsh conditions. They may have more poles and lines to help hold up against the wind. Other options are available, too, such as a rain fly, a vestibule, and mesh windows. Tunnel tents can accommodate one to four people, depending on the size. Now you have read about all the different camping tent styles to consider when you choose your new tent. I hope that you are better prepared to make that big decision: Which one is the best for you?